I love homes - I think that's very clear. But there are three (sub)categories that are my absolute passions (terrible description but have been driving for many,many hours). The first - obviously quilts (and by default all textile wonders). I have "laboured" over the selection of colours in this house. Taking the colours that I love most (white, black and grey) and applying them with the greatest respect to this 1874 house has been a challenge. Should I have gone with the original chocolate brown, putty et al? I didn't, because in my home, I need the outlines that black gives (we have black doors and radiators), the light that this shade of white bounces around (SAD anyone - I need more light than is probable in a London February. Then grey, because that perfect oyster colour is part Vionnet and part pumice on a NZ beach. Lastly, but by no means least, ceramics. All food goes on a platter or a bowl here. Sharing and passing around an important ritual in this home. Jugs are used for water, flowers, wine - whatever. All handmade - all with the mark of the maker, and all loved. Many gifts and many more carried back on a plane on my lap. 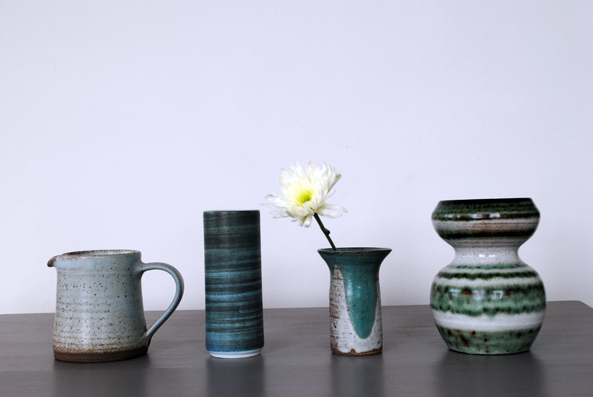 We've been dabbling with selling vintage ceramics. It's gone super lovely well. We have sold out. I wondered why and then an email from a store in the States alerted me to the fact that we're in Elle Decoration. Thanks very much.